Pest is problem is a regular for most of the pet parents and quite annoying as well. Though the market has a gamut of treatments that work against fleas, ticks, and other parasites, it is difficult to discern the correct treatment for your Fido. Frontline Plus, Advantage, and K9 Advantix are the three products that are quite popularly used today to treat the parasitic infestation. Pet owners often wonder in bewilderment as to what treatment should they give to their pets when they have a number of choices. 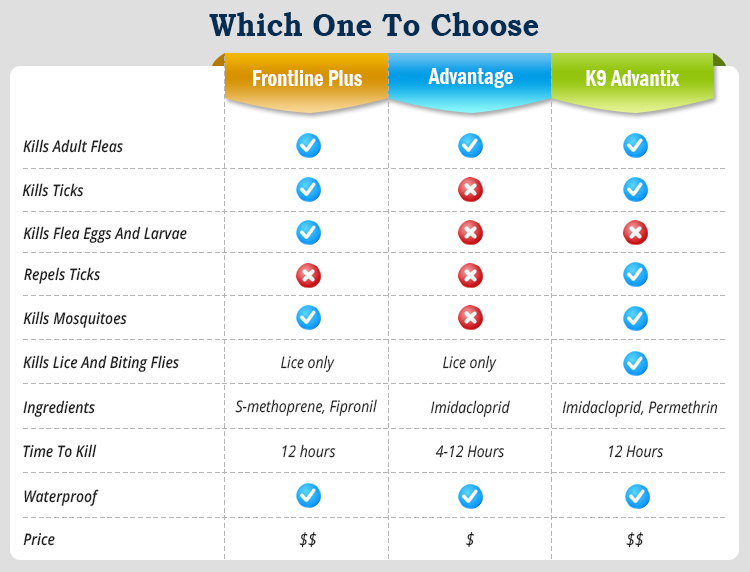 To ease out this dilemma, we have made a comparison between Frontline Plus, Advantage, and K9 Advantix which will help comprehend their action and benefits. If we go by the comparison chart, the difference stated here are quite vivid. When we compare Frontline Plus with Advantage, Frontline covers most of the issues like adult fleas, ticks and also disrupts their lifecycle by killings the eggs and larvae. However, Advantage does kill adult fleas but it doesn’t kill ticks and also doesn’t eliminate eggs or larva of fleas. Killing mosquitoes and repelling ticks is also not a part of Advantage function. So the question arises – Why would anyone choose Advantage? Most of the people go for Advantage as it is considered to be less harsh in chemicals than Frontline. Pets that are sensitive and have mild flea infestation thus can be treated with Advantage easily. Additionally, the product works more quickly than Frontline. Frontline is used generally for heavy flea and tick infestation. It is potent in disrupting the lifecycle of these parasites as well thereby giving a complete protection against flea infestation and recurrence. People that live in areas where mosquitoes are heavy can use Frontline Plus as it gives added safety against these nasty insects that can transmit heartworms. Frontline Plus and K9 Advantix are almost similar in prices and are equally effective against fleas and ticks. In fact, they both are applied topically to the pet’s body. The main difference between them is – Frontline Plus also eliminates flea and tick eggs and larvae apart from killing their adult forms. However, K9 Advantix only kills adult flea and ticks. It is ineffective against other phases of flea and tick life cycle. Moreover, you cannot use K9 Advantix on Cats as permethrin in K9 Advantix is toxic to felines whereas Frontline Plus is available for both dogs as well as cats. Other than killing adult fleas and ticks, it also repels them. Their repellent action also wards off mosquitoes, lice, biting flies which are transmitters of many diseases in pets. When the pet is already protected from their bites, the chances of him developing the disease also fall drastically. So if you have a dog as a pet and that too of a kind that loves to roam outdoors, K9 Advantix is perfect for such pet owners. Here, K9 Advantix is a clear winner until you won’t have to treat a cat. K9 Advantix provides holistic treatment to many parasites whereas Advantage is just used against mild flea infestation. The lower the protection, lower are the prices. Thus, Advantage is a cheaper option. If your dog doesn’t have ticks and prefer to stay indoors, the advantage would be best for him. K9 Advantix, on the other hand, is best for treating as well as repelling most of the pests and insects. All three products are topical, therefore, the application is same for all three of them. All of them are highly effective against the infestations they are meant for. 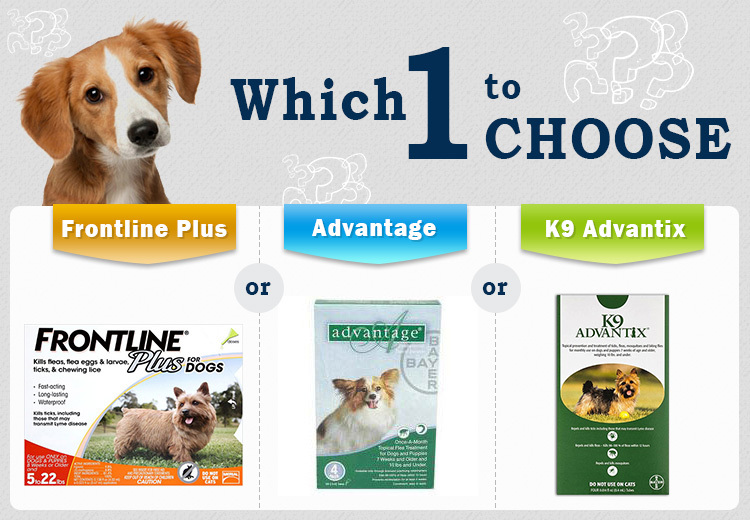 Now, the choice of the product completely depends on the requirement of a pet owner. They must well-judge the case of their pet and purchase the treatments accordingly. Still, if they find some confusion, it is advisable to consult the vet before purchasing any sort of treatment. Hope, this blog gave enough clarity about these three major flea and tick products. So, all we need to convey is – shop wisely and give the correct treatment to your little munchkin!